#VT – Welcome to the good people of Monkton, Ferrisburgh and Enosburgh to Front Porch Forum. Anyone living in these towns may now join their FPF at FrontPorchForum.com. And a special thanks to the Monkton Community Coffeehouse, Enosburg Area Business Assn., Enosburgh Town School District, Town of Ferrisburgh, and others for sponsoring this expansion of FPF services. We now cover 90 Vermont towns. Here’s a map and complete list. Task force groups are being formed to help address these key priorities. A number of volunteers signed up Wednesday but we hope more members of the Vergennes community will volunteer to join one or more task force groups. Simply reply to this email and let us know the task force(s) that you would like to participate in and we will add you to the list. And spread the word by forwarding this email along to others in the community. The next meeting in the Community Visit process has been scheduled for Wednesday, May 21 from 6:30 to 9:00pm at the Bixby Library. VCRD will bring a new Visiting Team of state, federal, regional, non-profit, and philanthropic leaders to Vergennes to help task force groups as they develop action steps and resource ideas to move these projects forward. Vergennes has set an ambitious agenda; it can succeed in these goals if residents line up for action. Hope to see you on May 21st! On April 16th over 100 Vergennes community members gathered in a community meeting to consider the ideas that were discussed through the Vergennes Community Visit process and to set priorities for action. At the meeting, the Vermont Council on Rural Development (VCRD) presented a list of all the key directions that the community had put on the table at the public forums on March 18th and school forums on March 4th. Participants discussed what was most important and most needed and voted on the priorities that they thought the community should line up to accomplish. Then, a number of folks signed up to serve on Task Forces to move these issues forward over the course of the next year. The top 3 priorities that participants chose are listed below. Vergennes Community Visit Priorities Determined by Vergennes community members at the VCRD Community Meeting, April 16th 2014. A Vergennes Transportation Task Force could work to systematically improve town walkability, public safety and, by improving parking options, contribute to downtown commerce. This working group could expand parking areas and work with all downtown businesses to get all employees to park away from critical spots for customers in the downtown. The working group could advocate for crosswalk enhancements, expanded signage and lights (including for the train station when stops begin in 2016) and areas for sidewalk improvements. Some residents would like to see improvements for walkability by the bridge and access to the falls, including the idea of ultimately developing a walking bridge for viewing the falls. A task force on transportation could also promote bike lanes, trails and racks and look into opportunities for a shuttle or other public transportation in Vergennes. An Economic Development Task Force should be developed to take leadership in promoting businesses in Vergennes and surrounding towns, and systematically working to attract and grow new businesses that fit with the community. Residents would like to see additional businesses that expand and balance with the downtown, including a brew pub, bike and canoe rental outfitter and businesses that would attract and serve young people. An economic development plan could be produced and implemented, potentially in partnership with the town of Ferrisburgh and other surrounding towns. The city could also consider hiring an economic development director to work with this leadership team and include representatives and investment from surrounding communities. The City of Vergennes could develop a citywide, local option one percent, sales and consumption tax to fund community and economic development in the city. Such a fund could potentially bring $130,000 annually that could be used to expand the capacity of the Vergennes Partnership, invest in community projects and recreational opportunities for youth, provide for improvements to streets, parking or infrastructure, expand amenities in the falls basin, or seed other urban renewal projects as determined by the voters and city council. 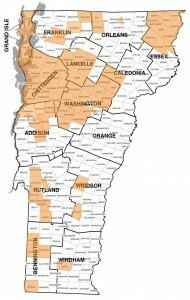 The basin and riverside are unparalleled but underutilized assets for the future of Vergennes. A Basin and Riverside Task Force could galvanize community volunteers for immediate work to improve the area and to plan longer term strategic improvements. Residents envision a small mooring field for visiting boaters, a modest expansion of the docks, improved trails, expanded seating and picnic tables, landscaping, beautification, extended WiFi, improved lighting on the east side, and better signage. Some see future steps including building a boat house with rest rooms, or even a pavilion on the west shore, and improving a gravel path or a board walk on the east side. Work should be completed to connect the rail trail to the park. With heritage trail signage and public artwork this area could be an enormous benefit to local folks and draw to tourists. Some envision a day when events, bands, food, and a new pedestrian bridge could make the basin a major attraction for the entire region.